backyardpoolsuperstore has no other items for sale. 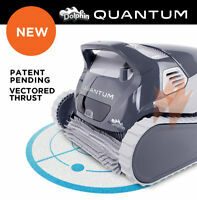 The Dolphin Nautilus Robotic Pool Cleaner is a must-have for pools up to 50-metres in length. Its CleverClean Technology scans pools to find the most efficient cleaning pathway, while its cartridge filter system is easy to clean. 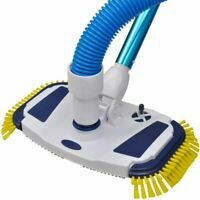 The system features a spring clean-up option and a swiveling tangle-proof cable. 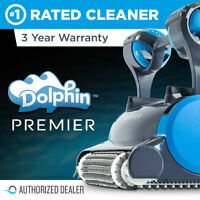 The cleaner can be set with a timer and takes just 2.5 hours to thoroughly scrub, vacuum, and filter pools. Sales tax may apply when shipping to: AL(8.36%), FL(7.0%), IA*, MN*, NV(8.25%), PA(6.0%), TX(8.25%), UT(7.1%), WA*, WV(6.0%). Good service and fast !!!! Super fast free shipping, exactly as advertised, great seller thanks! BEWARE! I returned an unused pool cleaner and was charged $140 restocking Fee! So far so good, climbs all over the in-ground plaster pool, really stirs the water up. Does pick up all the debris including leaves. All is not perfect, I have used the discontinued Jandy Ray Vac for years and it run off a separate motor and obviously was left in the pool all the time except to clean the inside collection basket. Spoiled me you could just leave it alone most of the time. The Dolphin unit cannot be left in the pool for long periods and needs lots of attention. The cord will cross loop so you have to watch it just about every time you run it. You have to pull the unit up and let the water drain out of it before you lift it out of the pool, with water it is heavy for me and my wife to lift. Taking it out of the pool and coiling the cord so it does not tangle is a task along with putting it up in a shaded are with the power supply. In AZ shade is still hot in the summer. It is working as advertised and I suppose as good or better than most of the units of this type. The key how long before it breaks down, it is made in Israel, which I think is much better than made in China. Getting it serviced might be a challenge. 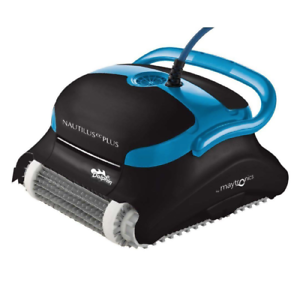 I got it at a good price comparatively and it is doing a fine job of cleaning the pool. It runs for 2 1/2 hour intervals, Just checked on mine, today it has been running for 2 hours so far and no tangles its doing great. But like I said its not recommended to leave it in the pool for extended periods. What is extended? I take it out every two days, for a day or so in the shade. Good luck and I hope this review was helpful. Should have bought this 10 years ago! One month in and we are very pleased with our dolphin pool cleaner. The pool is always crystal clear and that little guy can literally climb the walls! Not great with steps but easy to deal with in the shallow end. used it 8 times so far. Vacs and scrubs as advertised. Was kinda creepy first time it crawled up the side of the pool and started to clean at the waterline! We have a tanning deck in the pool with about 8 inches of water, it actually climbed the steps (pretty large) and did this area. Bottom Line: I put it in the pool and watched it for a while thinking to myself "it clearly works but how the heck is it going to know to clean every inch" as I watch it kind of randomly move around the pool and up the walls. Went shopping, came back, and the entire pool was spotless and it had shut off. It works! Love it. Good value and works great. Simple and effective. Works as advertised right out of the box. The pool has never been this clean. I only wish I did not have to use the cord to drag it back to the pool edge.